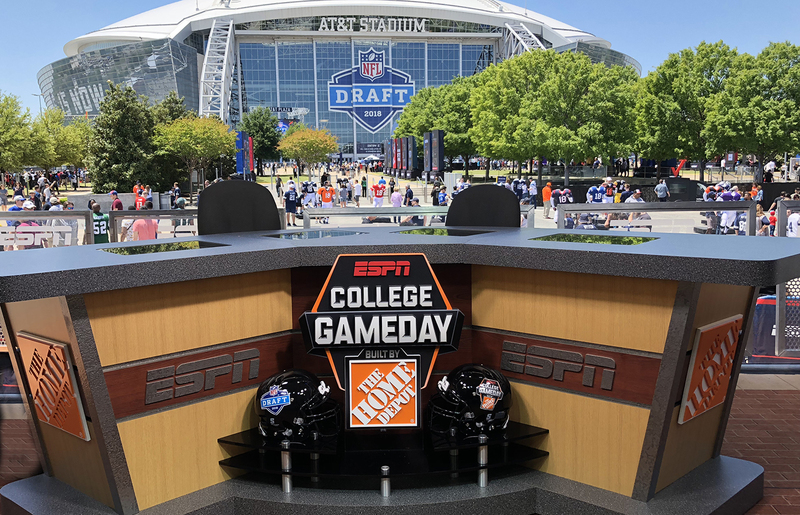 There’s a new kid on the block in ESPN’s NFL Draft coverage this year, with College GameDay added to the mix at AT&T Stadium in Arlington, TX. Now in its 39th consecutive year covering the Draft, ESPN will deliver its first dual-network coverage of tonight’s Round 1, with primary coverage airing on ESPN and a college-themed presentation on ESPN2. 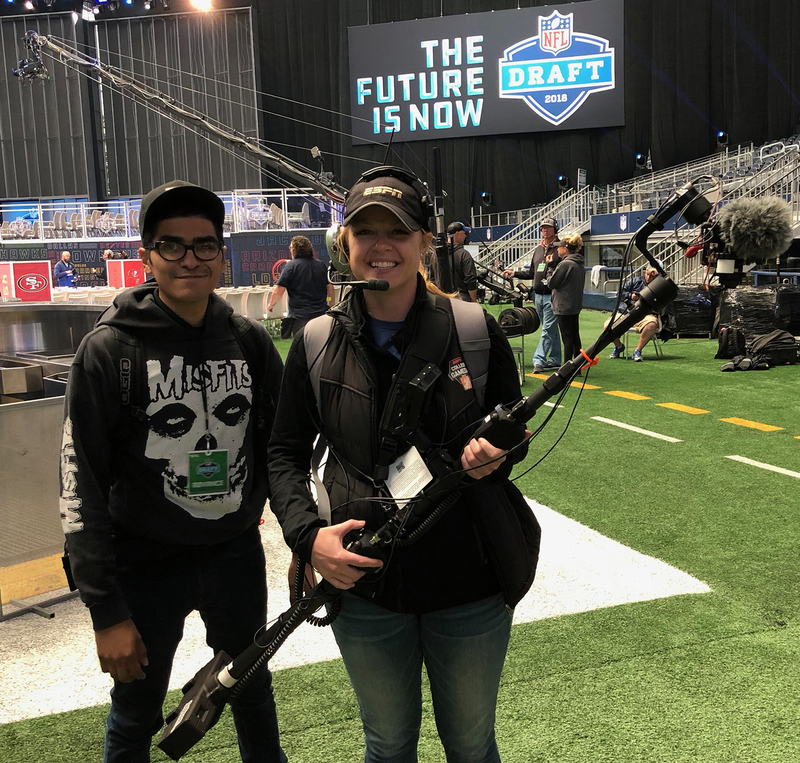 As a result, ESPN is rolling out its largest NFL Draft production to date, complete with several innovations, including a DigiBoom gimbal-stabilized camera rig. ESPN has deployed a pair of two-point aerial SupraCams — one inside and one outside — for the NFL Draft. The addition of GameDay brings essentially a second production to what was already one of ESPN’s largest shows of the year. 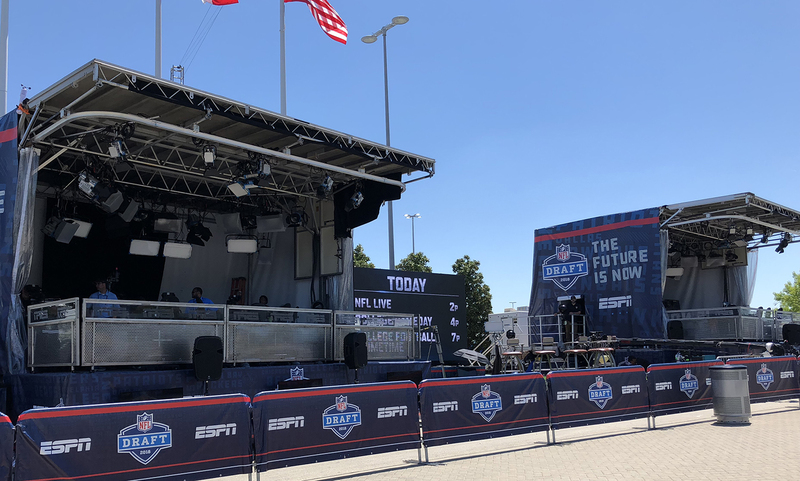 The GameDay team has its own dedicated set in the NFL Draft Experience area outside AT&T Stadium (adjacent to ESPN’s outdoor set), which will be used for pre-Draft editions of GameDay Thursday and Friday (both at 5 p.m. 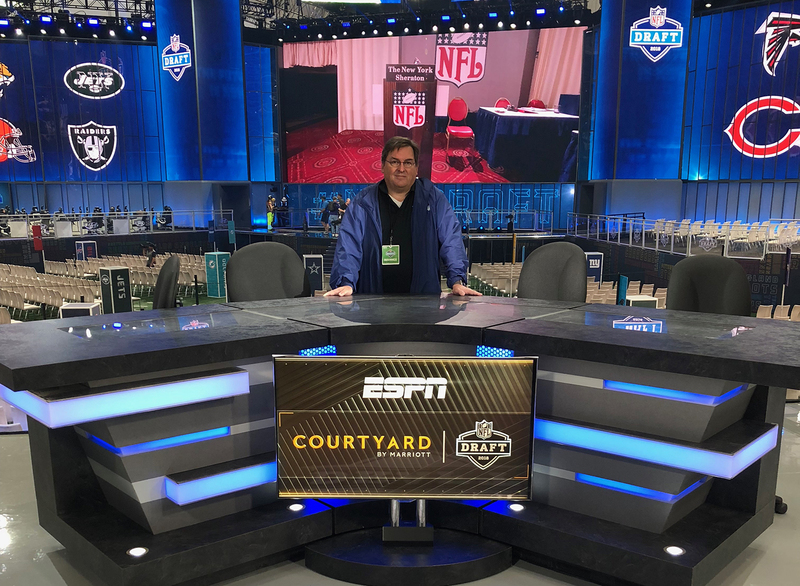 ET) on ESPN, as well as its simultaneous Draft coverage — dubbed College Football Primetime at the NFL Draft — Thursday night on ESPN2. 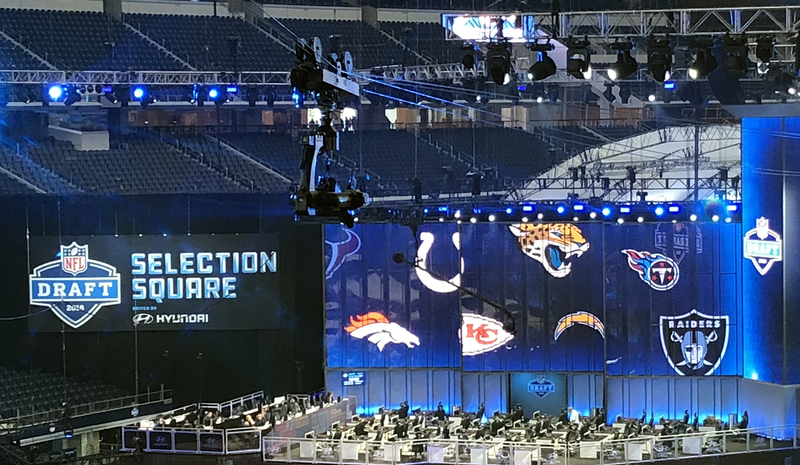 ESPN is using NEP’s EN1 set of production units once again for its NFL Draft coverage. Although the primary show is being produced out of NEP EN1 (A, B, C, D, and E units) and GameDay is operating independently out of its normal Game Creek Video Maverick unit, the two shows are still heavily intertwined. EN1 is located in the traditional truck compound inside AT&T Stadium; Maverick is outside at the overflow compound in Lot 2. The two trucks are fibered together, enabling them to share 24 camera feeds and have fully integrated communications. ESPN is also using EN1’s second control room, located in its D unit, which is typically used for Monday Night Countdown, to produce live editions of NFL Live and SportsCenter on Thursday and Friday. ESPN has deployed both an outdoor and an indoor set for its coverage, as has become customary at the Draft. 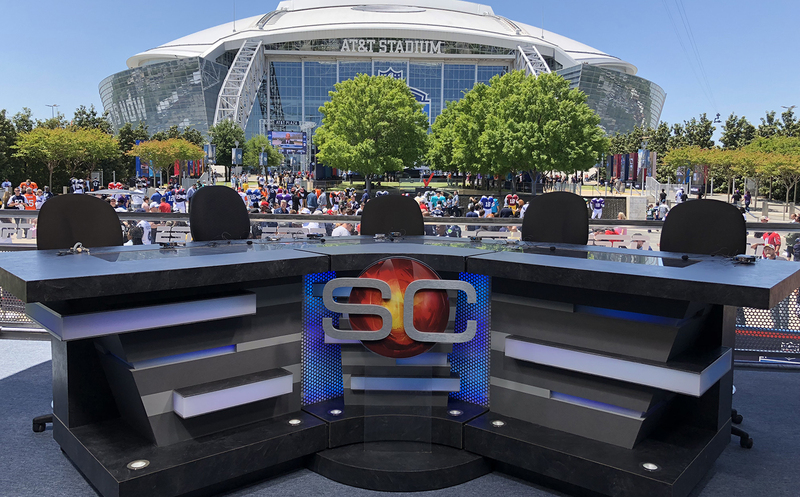 The ESPN desk inside the stadium will serve as its primary host location during Days 1 and 2, and the outdoor set in the NFL Experience area will serve as its main home on Day 3 (Rounds 4-7), when picks will be announced from teams’ facilities around the country and the coverage airs on ABC for the first time. “College GameDay,” occupying this outdoor set in Arlington, is on hand at the NFL Draft for the first time. 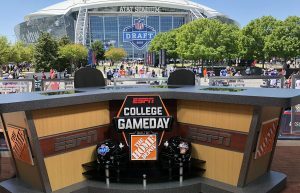 The GameDay set is located immediately next to ESPN’s outdoor set in the NFL Experience area, along with a demo-field set that allows the GameDay team to conduct demonstrations throughout the coverage. This set will serve as home to both pre-Draft editions of GameDay on Thursday and Friday and its simultaneous coverage of Round 1 on ESPN2 on Thursday. ESPN has deployed 31 of its own cameras at AT&T Stadium and is sharing an additional five at NFL Network’s positions. In addition, GameDay has eight dedicated cameras. Included in ESPN’s complement are two RF Steadicams and two RF handhelds (provided by BSI), two SupraCam two-point cable systems (one inside, one outside), five jibs (two integrated for AR virtual graphics), three robos (provided by Fletcher), and an aerial camera (provided by AVS). The highlight of this year’s Draft camera complement is surely the DigiBoom gimbal-stabilized camera rig provided by RedRock Micro. Unveiled this month at NAB 2018, the system is designed to combine the best elements of a gimbal, jib, Steadicam, and handheld camera into a single tool. With the DigiBoom, which features a long pole with a powered gimbal on the end that keeps shots smooth and steady, the operator can shoot from ground level to more than 8 ft. (or up to 12 ft. with an optional extension). The version debuting for the Draft features a Blackmagic Video Assist and Micro Studio Camera 4K and is being operated by ESPN Coordinating Studio Operator Brie Michaels. Feinberg demoed the DigiBoom at this year’s Rose Bowl and envisioned it as the perfect tool to provide intimate, up-close shots in the green room at the Draft. Of course, the Draft is about much more than just the onsite operation. 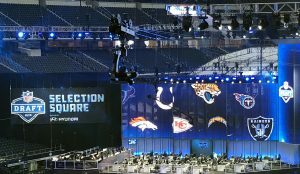 ESPN will once again have live camera shots coming in from 30 prospects’ homes, several NFL Draft war rooms at team sites, multiple Draft-viewing parties (including in Alabama, Georgia, and Wyoming and with Raiders fans in Las Vegas), and at team-centric and iconic NFL-city sites on Day 3, when the late-round picks will be announced. The main ESPN outdoor set and “College GameDay” set are side by side outside AT&T Stadium. ESPN has 13 inbound paths from its broadcast center in Bristol, CT, to route these feeds, all of which will be integrated onsite in the truck this year. Whether it’s a team in the war room deciding whom to draft or a producer at the front bench in the truck, a successful Draft comes down to one thing: preparation. 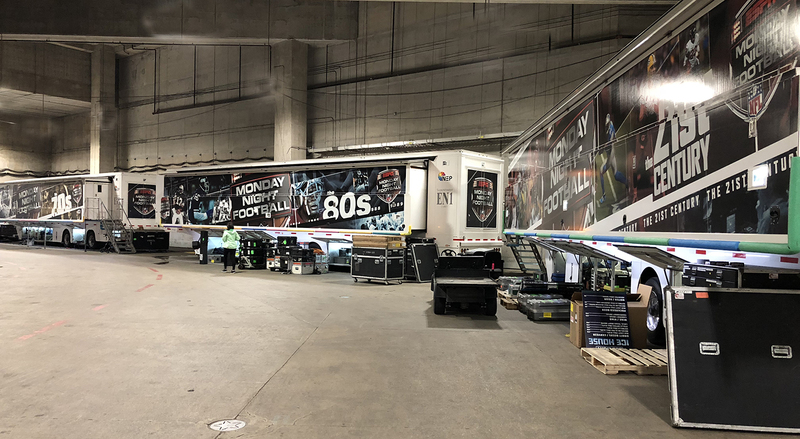 ESPN’s production team has done plenty of that: the network will enter Thursday’s first round with more than 500 player-highlight packages, 50 player personality bumps, and 25 specialty technical breakdowns at its disposal. 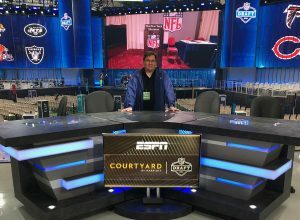 ESPN Senior Operations Manager Steve Carter at the network’s primary NFL Draft set inside AT&T Stadium. In addition, ESPN has two 1-Gbps circuits connecting to its Bristol servers for file-transfer needs, should ESPN’s library of content need to be accessed in creating new packages on the fly. In addition, ESPN is operating a redundant control room in Bristol in case any issues arise onsite, with all graphics and EVS clips being played out at home just in case.